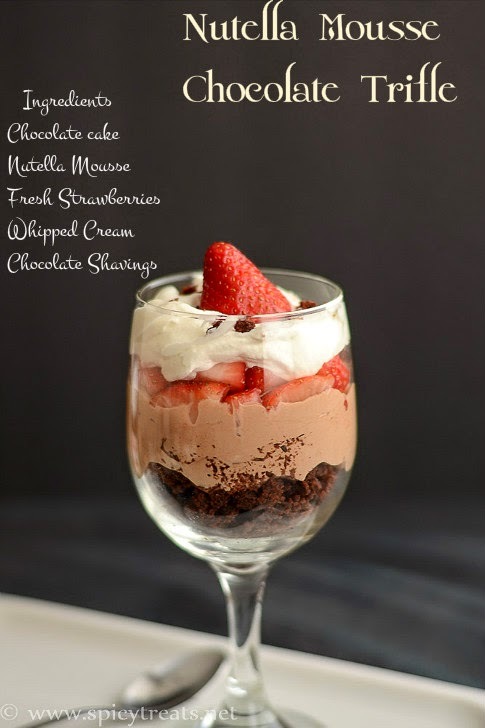 Nutella Mousse Trifle is a rich, delicious and elegant dessert that is perfect for any special occasion. 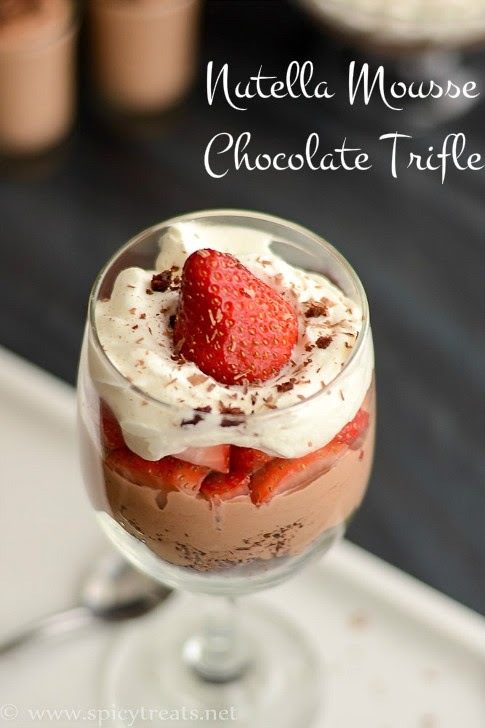 This is another treat for Nutella lovers, this trifle contains a layer of chocolate cake, Nutella Mousse, Fresh Strawberries, Whipped Cream & some dark chocolate shavings. Easy to assemble or you can layer it to your desired choice of cake and fruits with Nutella Mousse. Strawberry pairs well with any kind of cake and with chocolate and nutella mousse it tasted so good. I limited my portion with only 2 spoons and my kiddos enjoyed it a lot. 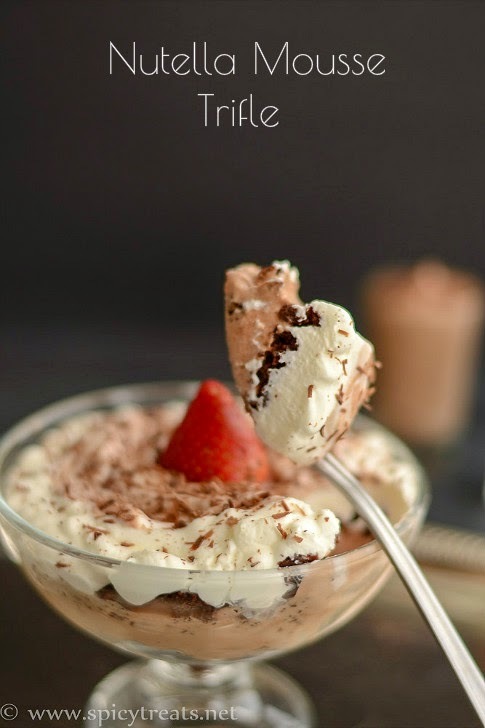 Once in a while or on special occasions make this simple yet delicious Nutella Trifle and treat yourself and your family. 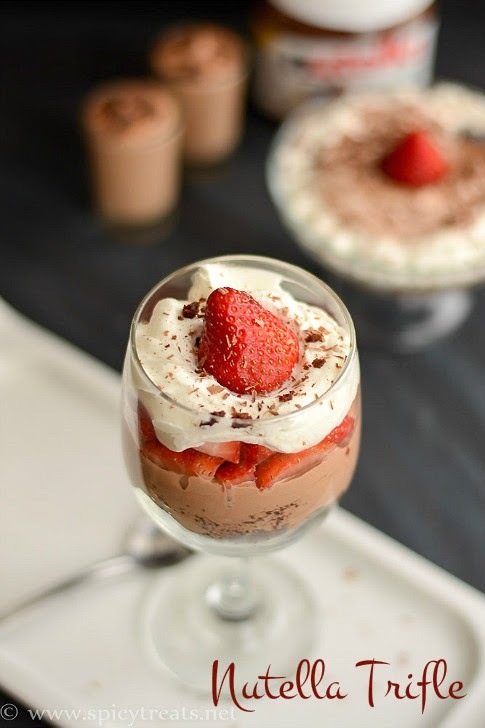 Prepare Nutella Mousse as per this recipe, chill it and use it to make trifle. To make Whipped Cream : Take 1/2 cup of heavy whipping cream in a chilled bowl, add 1-2 tbsp of sugar and whip it to soft peaks. That's it. In a serving glass or bowl, put one layer of chocolate cake. I sprinkle couple of tsp of simple syrup to prevent drying of cake but it is optional. Then, top it with nutella mousse(i put the mousse in a ziploc bag and piped into the serving glass). Next, add inthe cut strawberries and top it with whipped cream. Again repeat the chocolate cake layer, nutella mousse layer, fruit layer and whipped cream. Finally garnish with fresh whole strawberry and chocolate shavings. That's it...Nutella Trifle is ready to relish. You can use any desired chocolate cake or brownie too. I used my left over Hershey's chocolate cake. 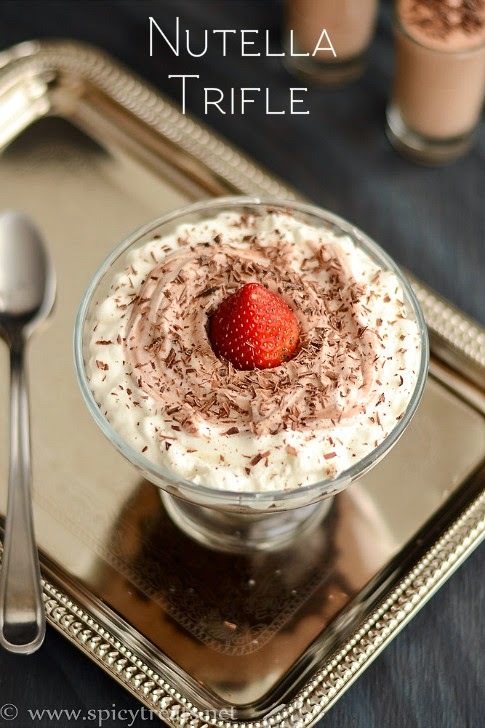 Adjust whipped cream & mousse to your taste and depending on your serving bowl/glass size. You can also use mixed berry fruit combo instead of strawberry or skip fruit and use cake, mousse and cream layer alone. Very Elegant Sangee. Your pictures are also amazing..
that's a lovely tempting dessert. Looks lovely. Very inviting clicks, drooling over them.. Very tempting dessert! Lovely presentation Sangee! Yummy luking trifle.love d simple ingds..
Hi.. I'm a regular reader of ur blog and tried quite a few recipes of urs too. Since there were no updates from ur side for the past three weeks, I was a bit worried.. Just wanted to make sure that everything is fine.. Wish u come back soon with a lot of recipes.. Thanks so much for those kinds words, really motivating and happy to have such lovely readers who really care for me and my recipes. I took a short break, will be back from next week. Keep watching for more yummy and interesting recipes. Thanks a lot !